Outstanding workmanship at a budget-friendly price. The Electro 64BLED features a color wash effect with smooth projection and rich color palates. It's perfect for stage performances, bands and mobile DJs. 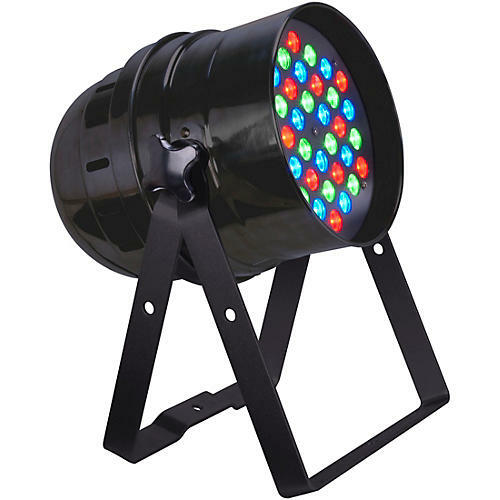 Known the world over for eye-catching, dynamic visual effects, Eliminator Lighting has perfected its manufacturing process to deliver truly affordable DJ Lighting and accessories. Its user-friendly DJ fixtures can transform your next event from ordinary to extraordinary, while its clamps, stands and lighting mixers simplify your setup and maximize efficiency. Above all, Eliminator Lighting provides top-notch, reliable products for mobile performers, night clubs and other venues—all with great customer support. See for yourself why Eliminator has a well-deserved reputation for outstanding quality and value. Eliminator clamps, stands and accessories are made to exacting standards from high-quality materials, giving you peace of mind when you have valuable fixtures mounted above your audience. Enjoy the quality and reliability Eliminator Lighting can deliver, gig after gig. Eliminator lighting fixtures create exciting visual displays that will dazzle your audiences, whether used in conjunction with Eliminator fog and atmospheric effects or on their own. However, adding an Eliminator fog or haze machine will maximize the impact of your Eliminator lighting, giving your audience the feeling of being immersed in the visual experience. No matter which Eliminator Lighting fixture you buy, you can count on an intuitive interface, efficient, cool-running LED light sources with an extra-long lifespan, and a variety of control options from DMX compatibility to automated, built-in programs such as sound active. High-quality products you can rely on—order today.